Inverness jumped back into the top four momentarily after second half goals from Aaron Doran and Tom Walsh plunged Partick further into the relegation battle. Stuart Bannigan had levelled for Partick before substitute Walsh leathered home a superb volley with ten minutes to go. Only Dundee United v Alloa on this weekend and we play the Wasps on Tuesday night to see if we can take further advantage of the situation. 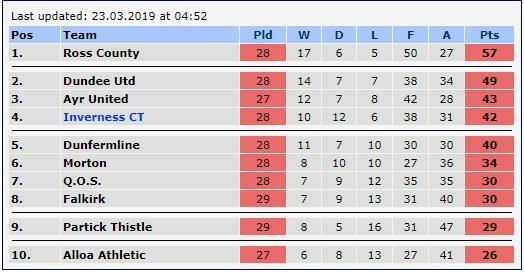 Should Alloa take full points from their two games in hand over Partick, then they will jump to seventh and the Harry Wraggs will slump to the bottom. It's that tight! Inverness had Tom Walsh and Kevin McHattie on the bench after injury alongside Nathan Austin with young prospect Matheus Machado joining the squad after recent impressive performances in training. Partick Thistle had Gary Harkins and Scott McDonald starting with Blair Spittal warming the bench along with Miles Storey, the former Inverness enigma. Keeper Conor Hazard was on international duty with Northern Ireland and Jamie Sneddon replaced him. A wet and miserable night met the players as they came out in front of a sparse crowd and Scott McDonald started the ball rolling in this televised game. It was ten minutes before Carl Tremarco had the first attempt, but his sneaky curler lacked power with better options available. It was a midfield battle at this point with neither side able to get to grips with the conditions. Partick forced a couple of corners and the second one produced a moment of uncertainty in the visitors defence but the ball was hacked to safety eventually from almost on the goal line. Similar followed at the other end after Charlie Trafford won a free kick, but defences prevailed. Another free kick saw the ball fired over the bar by Sean Welsh after Joe Chalmers had been fouled. 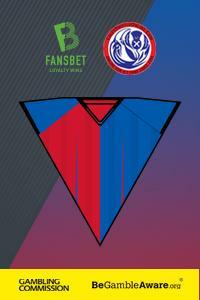 Aaron Doran drew a booking from Steven Anderson as the Caley Jags player broke over the halfway line. Doran did slide the ball into the net shortly after but was offside. Most of the possession was coming from the visitors midway through the half, but chances were at a premium. Anderson headed over Mark Ridgers' bar after a corner but it was an untidy game so far and Lewis Mansell was booked for fouling Jamie McCart. The first positive action of the half saw Inverness break at speed and Chalmers brought out a good save from Jamie Sneddon at the expense of a corner. Moments later, Doran slid a teasing ball across goal but it was neither a shot or a cross and the chance went abegging. Five minutes before the break another opportunity arose in the Partick box but it was tidied up and chested back to the keeper on the goal line. Inverness almost broke the deadlock but for a superb save by Sneddon from a Brad Mckay header, the rebound being hustled out of play by a sliding Tremarco. Close, but no cigar. 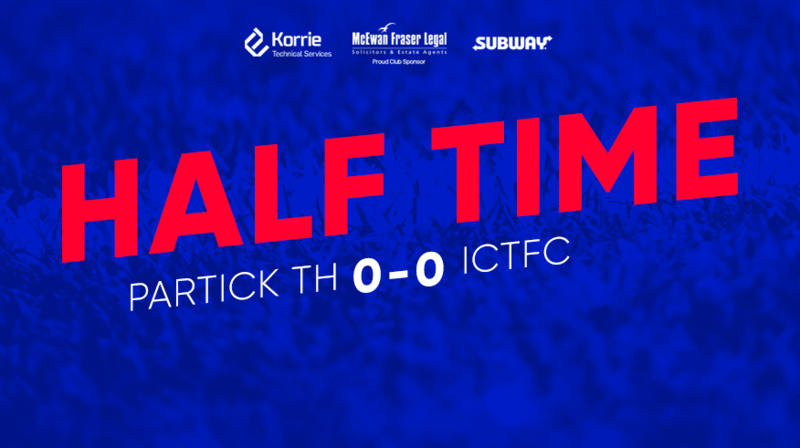 It had been a brutal first 45 with Inverness looking the most likely to score, but Partick's robust tactics saw them go in level at the break but leading 4-0 in bookings as John Beaton pointed to the dressing rooms. The brutal fare continued at the start of the second half with Partick not shy to stop the game at the expense of free kicks, carefully taking it in turn to foul the visiting players to avoid an inevitable red card. Suddenly, they realised they could play football and it was game on as the play opened out, the tempo of the game increased dramatically and the first half was soon forgotten. Saunders did find the net but it was ruled out for offsides after a Slater volley had been deflected for a corner. Ridgers scooped up a low strike from Slater that went straight at him as Partick decided to have a go and at the other end Doran created a bit of space to fire at goal but Sneddon was untroubled as he gathered. Liam Polworth seriously needs some shooting practice as he fired his nth effort well wide of the target. McDonald must have been studying Liam and he shot twenty yards wide at the other end. Substitute Miles Storey's power and pace was causing some problems and from one burst forward he slid a dangerous ball into the box but thankfully it went behind all the forwards and was cleared. Partick were beginning to look more dangerous since the substitutions but it was Inverness that made the breakthrough. Aaron Doran raced onto a tremendous ball through the middle from Joe Chalmers and a wee dummy from big Jordan White created the space for Doran to fire behind Sneddon. Well worked and well deserved. However, it didn't take long for Partick to level as Stuart Bannigan curled a low effort behind Ridgers from the edge of the box three minutes later. Tom Walsh replaced Charlie Trafford and Coll Donaldson had to look sharp to thwart Storey as he broke forward. Substitute Blair Spittal looked as though he rattled the back edge of the post as Partick broke forward although Ridgers looked to have it covered. 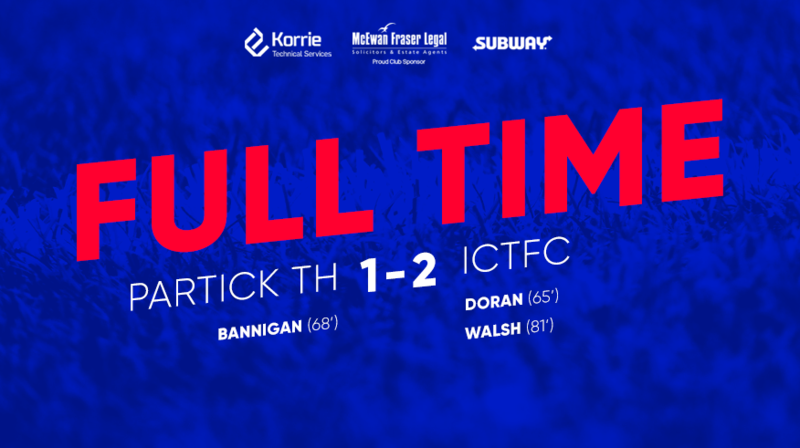 Inverness went back in front when Polworth chipped a ball into the box and a cheeky flick from Doran saw substitute Tom Walsh lash a left foot volley home from fifteen yards with ten minutes left. Tremendous goal by Walsh who had scored the winner last time Inverness were here with an equally stunning strike. It could have been three soon after but Sneddon did well to smother an effort from Doran as he closed in on goal. Inverness began to look more composed after getting their noses in front again and took the ball for a walk to the corners to see out the game. Coll Donaldson picked up a booking late on as Partick tried to surge forward but Inverness held firm for all three points in a deserved win at Firhill. Aaron Doran was deserving of his Man of the Match award and he was ably backed up by the fleet footed Jordan White (not a phrase I use often so enjoy it), a wonderful assist for the opening goal by the big striker. Coll Donaldson held the defence together and Tom Walsh's goal was simply stunning. This is not a win to be scoffed at with Partick battling for points to avoid the drop. Inverness boss John Robertson said on BBC SPORT: "It was a great first goal; great ball through by Joe Chalmers and a beautiful step-over from Jordan White, and the finish by Aaron Doran. "But then we fell asleep, Thistle upped the tempo and got their equaliser. We weathered the storm and got another brilliant finish. It was a deserved three points. "The next few weeks are a big ask but we showed tonight we have the players to handle it." Slater, Mansell (Storey 55), McMillian, Saunders. Subs (not used): Lennox, McGinty, Doolan, Fitzpatrick..
Welsh, Doran (Rooney 86), White. Subs (not used): C Mackay, McCauley, Austin, McHattie, Machado.